After a tentative first few minutes, the film soon gets into its stride, gently persuading us to associate with the quiet and unassuming Oskar as he wanders lonely as the proverbial cloud, only to be physically targeted at the only place where he mixes with other people. All this happens amidst beautiful landscape settings of snow-covered... well, everything really. Eli is lonely too, but for a very different reason. She wants to befriend Oskar, whilst clearly being afraid to get too close to anybody. So, the reluctant friendship blossoms over time, and they find they can help each other with their individual problems. The story is told with a great deal of subtlety, the balance spot on. I found myself drawn into this film at the outset, and became immersed until the quite magnificent ending. 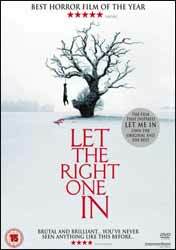 Let the Right One In is poignant, emotional, and quite gorgeous in every move it makes. The film deservedly won many award around the world. It’s been described as the best horror film of the last decade, but that’s less than accurate because this just doesn’t feel like a horror film. It’s a people film - more about the friendship - and simply exquisite. The deleted scenes show that the balance could have been very different. I would recommend this Scandinavian subtitled film to anyone, whether a genre-lover or not. It will come as no surprise to most that this movie has been remade for the Hollywood market, retitled Let Me In. I haven’t seen it yet, however, I am led to believe there is more of an emphasis on vampirism than on the friendship at the heart of the tale (I almost made it through the review without mentioning the word). What is good news is that the new film has been made by Hammer, who have returned to their ancestral seat at Bray Studios for the first time in decades. Buy this original version without delay.